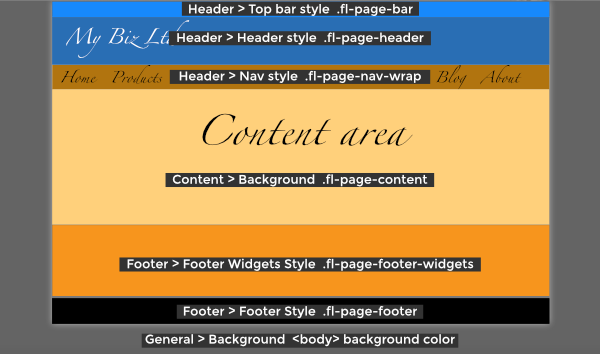 The following diagram of a boxed layout shows each of the Beaver Builder Theme's header, content, footer, and page areas mapped to Customizer setting and CSS class. Note: This diagram also applies to full-width layout, but the page background color (set at General > Background) will only appear in a thin band at the bottom of the browser page under certain viewing conditions. The top bar background and text colors can be set at Customize > Header > Top bar style, which translates to the CSS class .fl-page-bar. The header background and text colors can be set at Customize > Header > Header style, which translates to the CSS class .fl-page-header. If you choose a Preset layout whose nav bar is a different color from the header, you can customize the nav bar at Customize > Header > Nav style, or you can write a CSS rule for the class .fl-page-nav-wrap. The background for the content area is set at Customize > Content > Content background and translates to the CSS class .fl-page-content. The footer widget background and text colors can be set at Customize > Footer > Footer widgets style, which translates to the CSS class .fl-page-footer-widgets. The footer background and text colors can be set at Customize > Footer > Footer style, which translates to .fl-page-footer. The page background color, which displayed outside the box, is set at Customize > General > Background. This background color is set on the <body> tag. Where do menu colors come from?